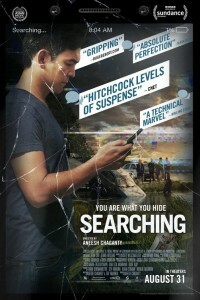 At first glance, especially taking a look at the poster and trailer of the movie Searching, you might think that it is just another low budget, B-movie thriller, reminiscent of the recent films Friend Request, Unfriended and Unfriended: Dark Web, which feature a bunch of unknown teens getting into all sorts of trouble on the internet. While Searching, starring John Cho, as father David Kim, of sixteen-year-old Margot who goes missing one night, takes place virtually entirely online – we watch the movie with the action taking place via computer screens, cellphones, YouTube videos and video cameras – the story is as compelling as any Law and Order: SVU episode but not “ripped from the headlines.” Searching’s unique twist makes it one of the most satisfying, big screen movie-going experiences of the year. The movie starts off with a montage in which we see David and his wife Pamela (Sara Sohn) rejoicing over the fact that she is pregnant. The first 10 minutes of the film provide us a look into the couple’s marriage and the raising of their daughter, with four young actresses playing Margot in those 10 minutes. Once we arrive at the present, we find out that Pamela has died, and that David is a single dad, raising his teenage daughter who does what all teens do, talk to their parents primarily via text, lying to her father in order to get her way and forgetting to take out the trash. Within minutes Margot is gone, David is freaking out, and Detective Vick, (Debra Messing of Will and Grace), lead detective on the just opened case, and David develop an immediate bond. Vick is at David’s disposable any time he needs her. She has given him her personal cell phone number and he is not afraid to use it at 3am if he thinks there is something she needs to know in order to find his missing daughter. The entire movie is told through David’s perspective. In order to try to find his missing daughter, he hacks her computer, and the pieces of her disappearance and who may have kidnapped her start to come together. Or so he thinks. At one point he is so convinced that his brother has committed the crime that he nearly has a mental breakdown. Searching is not a long movie, but it plays like a roller coaster ride. Just when you think the kidnapper is in your sights and of the police you realize that, woops, maybe that suspect isn’t the kidnapper after all. It is very rare that a movie that has only two main characters (John Cho and Debra Messing), with the many suspects and daughter Margot there just as much as necessary, can keep you on the edge of your seat. The last movie that did that for me was the brilliant movie Locke, starring Tom Hardy, in which he was the only star. The other character was the person on the other end of the phone. Searching is one of the best movies of the summer – and it didn’t cost $200 million to produce or need Tom Cruise to headline it for it to stand out. This is proof that if a script goes above and beyond, the direction and acting are impeccable and a producer, in this case Timur Bekmambetov, perhaps best known for directing the movies Wanted (starring Angelina Jolie and Morgan Freeman) and Abraham Lincoln: Vampire Hunter.